Stable favourite Destiny’s Kiss will get his preferred ground at Randwick where the Joe Pride-trained veteran will attempt to defend the City Tattersalls Club Cup. The 10-year-old has won 18 races, 13 on soft or heavy surfaces which is the likelihood on Saturday with rain predicted in Sydney until Thursday. Pride has also entered Tamarack and Cosmologist in Saturday’s 2400m-Listed race but the former will not run on a rain-affected track. The trainer is not concerned Destiny’s Kiss missed a barrier trial at Hawkesbury on Monday when the session was called off because of the wet. “I’m happy with Destiny’s Kiss,” Pride said. Cosmologist is also adept in the wet with three wins from three starts on soft and heavy. Destiny’s Kiss is the top-rated of the 12 nominations for the Cup at 104 ahead of Saturday’s St Leger winner Big Blue at 103. Pride has dual Group Three winner Pecans entered for the Nivison (1200m) for mares with Eckstein and Egyptian Symbol heading the 15 entries for that race. 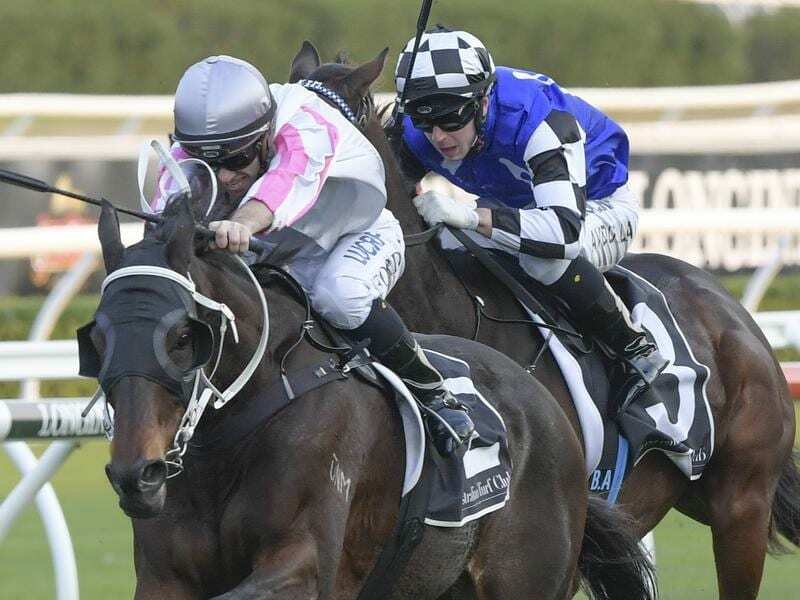 While Pride is hoping the wet continues in Sydney, Brisbane trainer Tony Gollan is desperate for the weather to clear for Ef Troop in the Listed Brian Crowley Stakes (1200m). Ef Troop was scratched from the Roman Consul Stakes and was last seen when unplaced in the Danehill Stakes at Flemington on September 15. The colt worked at Randwick on Saturday under Gollan’s supervision. “It was terrific work. He just continues to do well in the south,” Gollan said. “I don’t want to keep making excuses for him but surely he deserves some luck. Ef Troop started favourite in the Magic Millions 2YO Classic in January and finished fourth after racing fiercely. “Provided Sydney dries out he can run in the Brian Crowley Stakes) on Saturday and then we might look for something better,” Gollan said.